Everything info designers need to know about field research, but never ask! Since I started my journey as a design researcher, I realized that there was a big gap in the literature about using research–particularly qualitative research (i.e. not marketing research! )–in design practice, and even more in the field of information design. Simultaneously, as an information designer, I have always wanted to make research methods and my own learnings more accessible so that other design practitioners (and students) would be more inclined to use this type of research to inform their work, rather than ignore it. So, I finally did it! Over the past year, I have been working on the creation a practical guide for information designers that speaks their language and demystifies how to conduct a field research study. 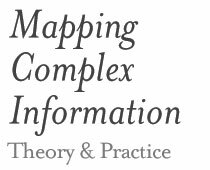 The result is the forthcoming book–Making Sense of Field Research: A practical Guide for Information Designers–that explains the use of field research specifically in the context of information design. Examples and guidance are geared towards the varied range of information design projects (e.g. creation of data visualisations, design of wayfinding systems, design of interface) and needs of information design practitioners (e.g. short timeframes, low budget). I placed special attention to the analysis of field research data, to help information designers make sense of what they gather in the field, as this is often a challenging step. Another key part of the book explains how to use research findings to inform design decisions. Over 80 figures, consisting of photos, tables, and more than 40 explanatory illustrations specifically created to communicate key processes, concepts and steps. Step-by-step instructions for the most common field research methods. Visual summaries to enable quick reference. Five real-world case studies to bring the principles and methods of field research to life. If you nodded your head “yes” to any of the above statements, then this new book will help change your perspective and open up a world of research possibilities to vastly improve the quality of your work. The goal is to help you–fellow and future information designers–build enough confidence to plan and conduct a field study in your next project. And add this type of research into your toolkit. My hope is that the use of visuals encourages you, not only to read, but to also use the book as part of your regular practice. Making Sense of Field Research: A Practical Guide for Information Designers will be available 24 July 2018 from Routledge and Amazon. Hola Sheila, enhorabuena por la publicación de este trabajo!!!! Muchísima ilusión leerlo. ¿Tienes previsto una edición digital? Muchas gracias Nadia! Creo que si habra una edicion digital, pero no estoy segura cuando estara disponible. Te informo en cuanto la editorial me confirme. Gracias nuevamente!